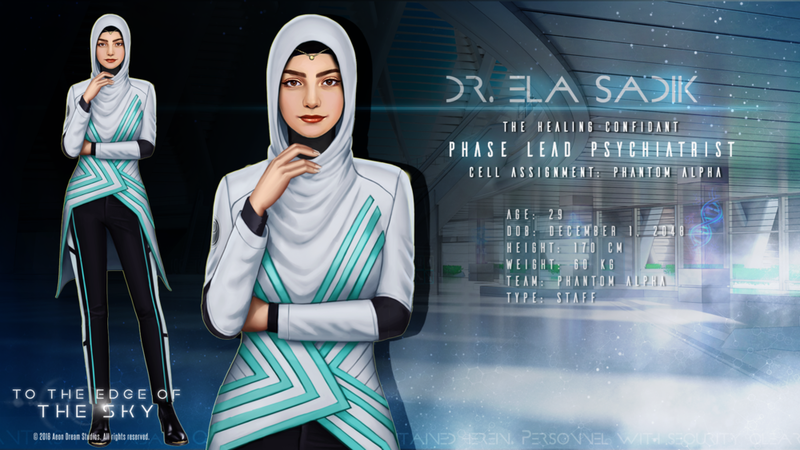 Meet Dr. Ela Sadik, a very special character. Dr. Sadik’s concept was created after SHINee Jonghyun’s passing back in December. It was our way of paying respect to his memory, with hopes of helping others by showing the importance of mental health care. Dr. Ela Sadik is also special in that she is a hijab-wearing, Muslim woman. Thinking about the discrimination they often face, Creative Director Ajané Celestin asked former TTEOTS artist Xxerru if she would be the face model for the character, as a Turkish Muslim woman herself. Please look forward to the detailed art and concept notes in the To the Edge of the Sky artbook, which will begin being created once the main story is finished. I was nervous about how to portray Dr. Sadik, because I am not well educated on Muslim culture. However, we spoke with her face model, Xxerru many times and I eventually spoke to many different Muslims through Twitter and learned about the dress of Muslim women. I learned that it varied a lot, but I wanted to portray it as conservatively as possible.